The Liberal Democrats support the spread of congestion charging across the country. The Lib Dem Transport spokesman hailed Ken Livingstone’s congestion charge. ‘The Government must provide leadership so that other local authorities considering introducing a similar system can proceed with the backing of the Government’ (Tom Brake, Press Association, 24 February 2003). 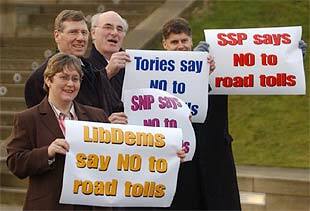 ‘Ministers must work with councils across Britain to identify congestion hotspots and introduce similar schemes’ (John Thurso, Lib Dem Press Release, Congestion charging success should be rolled out across UK, 19 August 2003). ‘Encourage local authorities to introduce road user charging schemes’ (Lib Dem Policy motion, passed at Bournemouth, 23 September 2003). ‘We welcome road congestion charging’ (Don Foster, Hansard, 9 July 2003, Col. 1183). Yet after all this we have an extraordinary statement and an extraordinary photograph from the Liberal Democrats in Edinburgh.